This is it - time for Anthony Joshua to go again. It's already been an eventful night of boxing, but the main event is moments away. AJ is looking for a 22nd consecutive career victory and another step on the road to legendary status. It's Anthony Joshua vs Alexander Povetkin, it's almost here and you can live stream the whole fight regardless of where you are in the world this weekend. There seems little doubt among boxing experts that AJ is destined for greatness. Still at only 28 years of age and with a record of 21-0-0, you can't argue with the potential. And beating Wladimir Klitschko a couple of years ago proves that he can hang with the greats. But the next couple of years appear to be crucial, as he begins putting his three world championship belts on the line against more reputable opposition – the likes of Deontay Wilder waiting in the wings. And that starts tonight with the experienced Russian fighter Alexander Povetkin. Povetkin is a former WBA heavyweight champ himself with only one blemish on his 35-fight record (a defeat to the aforementioned Klitschko). He's more than a mere wily old pro, as evidenced by his 24 career victories by KO. 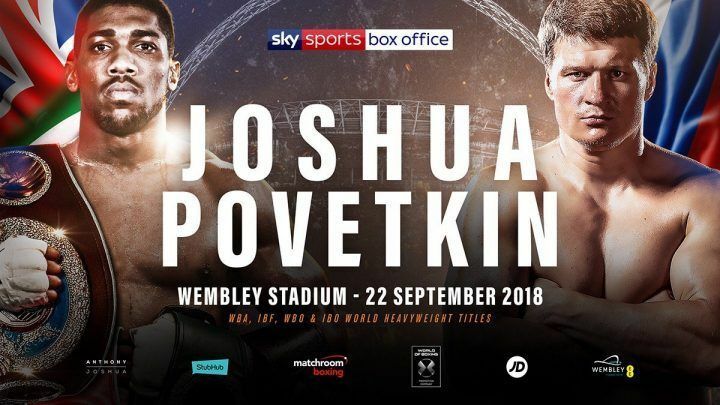 The Joshua vs Povetkin bout is due to commence at around 10pm BST at Wembley Stadium tonight and our live stream guide will tell you how you can watch it. Thanks to a VPN that's even if you're away in a country that isn't showing it. And if you're in the US or Canada, you can even watch for FREE on the DAZN streaming service! If the country where you live either isn't showing the fight or you want to catch the UK PPV coverage on Sky Box Office, then there's a simple way to get hold of a live stream. The trick is to download and install a VPN, which then allows you to change your IP address so you appear to be in a completely different location. Once it's been downloaded and installed, open the app and select a server location (it's super easy) of a country that is showing the fight as listed below. It's a familiar story for fight fans in the UK, as this will be a Sky Sports Box Office PPV. The price of this one is £19.95 – which is usual kind of price bracket for boxing on Box Office - and live coverage from Wembley starts at 6pm for the undercard. The main event is currently expected to start at around 10pm. If you find yourself outside the UK this weekend but still want to grab that Sky stream, you'll find that access is blocked due to geo restrictions. The way to get around this is by downloading and installing a VPN as described above. Where else has a Joshua vs Povetkin live stream? Well North Americans, there's a real treat in store for you to help you get on the Joshua bandwagon. DAZN is a relative newcomer to the live sports streaming community, but its force is growing. And the best thing is that you can get a FREE TRIAL, meaning that you can live stream Joshua vs Povetkin without paying a thing if you're a new customer. The links to follow are here for DAZN US and here for DAZN Canada and the fight will roughly start at 5pm ET / 2pm PT. If you're away from the continent this weekend but still want to jump on that DAZN stream, then be sure to use a VPN to watch it all as if you were back home. As in the US, Aussie fans have a usual go-to PPV channel for its boxing coverage. The appropriately named Main Event service is the place to head for Joshua vs Povetkin in a breakfast slot at around 7am on Sunday morning. It'll cost you $49.95 to buy the fight which will also get you access to Sunday replays at 10am, 5pm and midnight on Sunday. Sky Arena (Sky TV NZ's PPV station) is showing Joshua vs Povetkin for $34.95, with coverage due to kick ioff at 5am on Sunday morning.